Indoors or out, Camp Dewan is the spot! Spring Prairie Township- Every once in a while, John Dewan hears a hint of hesitation in the voice of someone calling him to ask about staying at Camp Dewan. "They'll say things like, 'I don't like to camp,' or 'I don't want to sleep in a barn,'"
But once visitors see the 55-acre wooded retreat, he said, they're often surprised to find the barn contains a fully equipped kitchen, a dining hall, a loft, and enough space to offer indoor half-court basketball. The camping facilities include a four-room lodge with a stone fireplace and two rustic five-room cabins that can sleep up to 20 people. The comfortable accommodations and the camp's close proximity to Chicago and Milwaukee, have drawn plenty of guests from Wisconsin, Illinois, Indiana and other states over the years. "Our tagline is 'a rural hide-away surprisingly close,'" Dewan said. When Chicago publisher Dewan and his wife Sue bought the property some 10 years ago, they were in the market for a hideaway for themselves only. But after their real estate agent showed them the land, they changed their minds. "This was just too beautiful a place to keep for ourselves," Dewan said. "This is a place we share with people." Camp Dewan has served as a gathering spot for group camping, family and class reunions, corporate events - company picnics or meetings, retreats, weddings - even Little league Tournaments, thanks to its professional Little League-style baseball field, batting cage and pitching machine. The property also includes two miles of hiking trails, campfire pits and plenty of space for tent camping, a volleyball court and ping-pong table, a bathhouse and a 7-acre pond for fishing, swimming and kayaking. Previous owners operated a Bible camp on the grounds, but Everett Bladow recalls the property in another light. Growing up during the late 1940s and early 1950s, Bladow lived there with his father and other family members, working for an Illinois owner who ran a dairy farm. "At the time, we were milking 24 cows," Bladow said. "We also grew corn, oats and hay." He remembered going down to a creek on the property to swim, playing ball in the fields and "when the haymow was empty, playing basketball in the barn." Bladow left the farm in 1957 to join the military, and hadn't been back until this summer, when he and his sister visited Camp Dewan. Much had changed in more than 50 years, he said. But the area retains its natural charm. On a recent morning, a pair of cranes took flight from beside the pond, circling over the water a few times before settling again in a nearby field. "Preserving the rural nature of the camp is important to us," Dewan said. "We really try to keep that atmosphere for people to enjoy." That preservation includes the barn, which had a gaping hole in its side when the couple bought the property. They called in renovators who specialize in repairing old barns. "These people will tear barns down, but they'll keep the wood, so that they can try to match it in other jobs," Bob Bywater, caretaker at Camp Dewan, said of the rehabbers. "They don't just go to Menard's to find something to match." A light coat of whitewash was applied to the interior of the barn, giving the boards a slightly weathered look. "The idea was to get more light in what can otherwise be a very dark space," Dewan said. 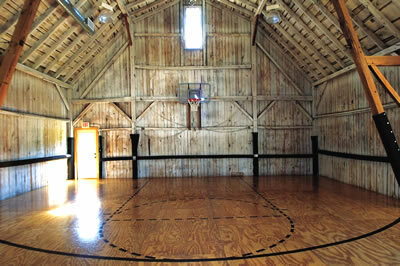 "It was important to us as we restored the barn that it was something useable going forward. 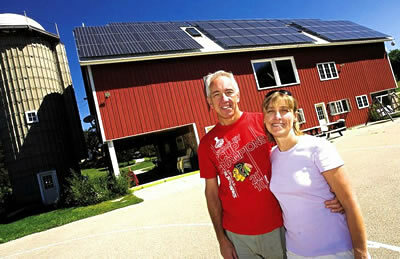 And Wisconsin really has the idea of preserving old barns." The barn at Camp Dewan was featured on a Public Broadcasting Service program, "Wisconsin Barns, Touchstones to the Past" on barns in the state that have been converted to other uses. The Dewans did some upgrades to the barn, including an air-conditioned hall, used for larger groups. They've made other changes, too, like adding a winding wooden stairway in the silo that leads to an observatory on the roof, complete with clamshell opening and telescope. Dewan uses the observatory to put on astronomy programs. The couple also installed rooftop solar panels on some of the buildings, creating 90 percent off the energy used in operations, Dewan said. Licensed to accommodate up to 60 overnight guests, Camp Dewan has hosted groups as small as a single family, and as large as a troop of Boy Scouts or Girl Scouts. Anna Adsit got to know Camp Dewan when the East Troy optometrist's clinic she worked for held a couple of company events there. She decided the settling was perfect for her August wedding two years ago. Although she set up tables for a reception in the scenic outdoors, Adsit also appreciated the air conditioned hall in the barn, and she said her guests enjoyed themselves. "Some went canoeing, she recalled. "And there were so many activities for the kids to do. They really enjoyed the pitching machine and batting cages." Dewan said the camp is booked on weekends, particularly in the summer. It is, however, open year-round. "In the winter, often people will come up here and stay and then go to Alpine valley, the Kettle Moraine or other areas to cross-country ski," Dewan said. Sue Dewan said the camp has been used by groups as varied as quilters on a relaxing weekend getaway to a group of Buddhists needing a spiritual retreat, but it's become popular for family get-togethers, especially since there are a number of activities that appeal to both adults and children. "The kids are always playing basketball, nonstop," she said. "We have two kayaks, a canoe and a fishing boat that get a lot of use. And campfires are usually going on the weekends." But despite the appeal of the outdoors, people still like the comforts of home, Dewan said. So the camp offers wired and wireless Internet access, and a loft in the barn with a 9-foot movie screen, a collection of DVDs and plenty of comfy seating. "People really love it," he said of the home theater. "They use it all the time." "We have another tagline: 'When you rent Camp Dewan, you own Camp Dewan." Copyright 2012 Camp Dewan, Inc.